Penelitian - Manchester-based Volcanologists have developed a method and camera that could help reduce the dangers, health risks and travel impacts of ash plumes during a volcanic eruption. 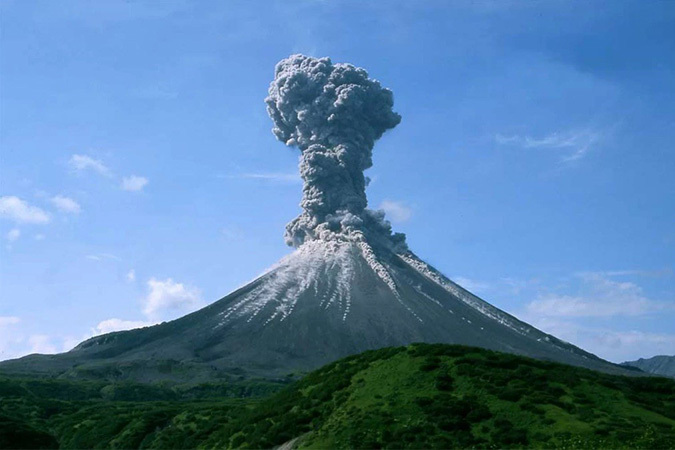 Ash is sometimes seen as a secondary danger in volcanoes when compared to more visual hazards, such as lava and pyroclastic flows. However, ash can have a major impact on human lives and infrastructure, such as the 2010 eruption of the Icelandic volcano, Eyjafjallajökull, which brought international aviation across Europe to a standstill. This research, which is being published in Scientific Reports, uses a new kind camera, developed at The University of Manchester, to measure the flow and speed of ash falling out of a volcanic plume. The researchers measure how ash particles interact with sunlight and, specifically, how they change the polarisation of sunlight, in a similar way to how polarised sunglasses work. This wouldn't have been possible without the development of the new "AshCam" which is the first camera of its kind in the world. During a volcanic eruption heavy ash fall can lead to building collapse, potentially injuring or killing those inside. Plus exposure to ash can cause irritation to the nose, throat and eyes, as well as aggravating pre-existing health conditions such as asthma. But ash is also a major danger to other critical human infrastructure, including electrical, water and transportation networks, especially air travel - such as the 2010 Icelandic eruption. "The Icelandic eruption in 2010 highlighted to the whole world that ash-rich volcanic eruptions can have a major impact on the global economy through air space closures designed to minimise the risk of jet engine failure due to ash clogging," Burton said. The team visited Santiaguito Lava Dome, part of Santa Maria volcano in Guatemala, and measured a series of explosions with the camera. Santiaguito produces a number of these explosions every day, approximately one every two hours, making it the ideal place to test out new equipment, techniques and research models. "Models of ash dispersion are key to forecasting the concentrations of ash during an eruption, which ultimately determine which air space is closed," said Burton. "Our research helps to measure the dynamics of ash fallout during an eruption. This gives us new insights into volcanic ash dynamics, providing an important step towards improved models of ash dispersion," Burton added. Previous studies have used ground-based UV cameras for the observation of volcanic ash or measured black carbon particles in ship emissions. However, these methods were unable to distinguish ash from other particles in the plume, making it difficult to measure the flow of the ash. This is where "AshCam" is different. It is made up of commercial cameras already available on the market that have been adapted with special filters that can identify ash more easily using sunlight. "This is an exciting development as it offers volcanologists a tool that allows them to easily measure the dynamics of ash plumes using only sunlight. The results from these measurements can be used to inform ash dispersal models, potentially improving their accuracy and effectiveness in mitigating the risks posed by ash plumes," Esse said.